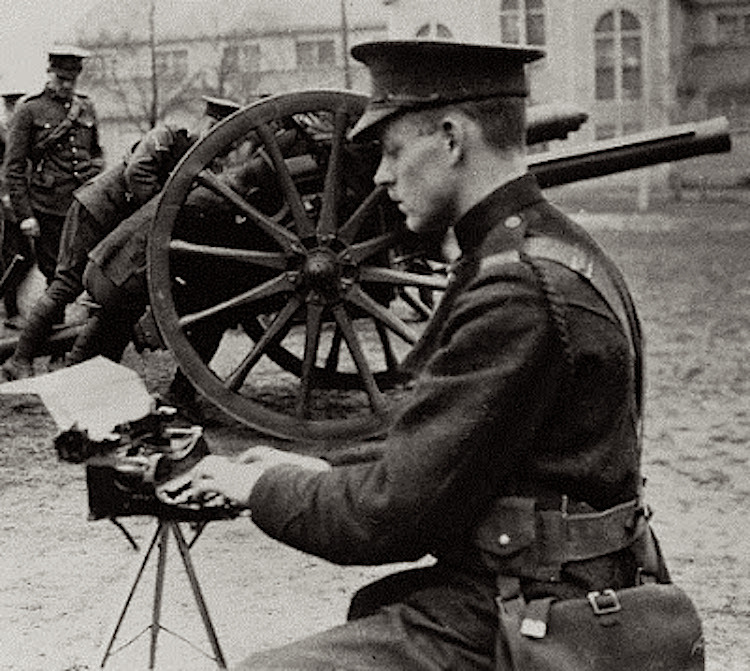 Soldier using a Corona 3 during World War I. Read about the tripod for this machine at oz.Typewriter.com (see here). While much has been written about rationing and retooling during World War II, not as much has been said about the war effort during The Great War. What impact did the war have on typewriter manufacturing? The editor estimated that Germany’s output before the war was 200,000 machines per year. 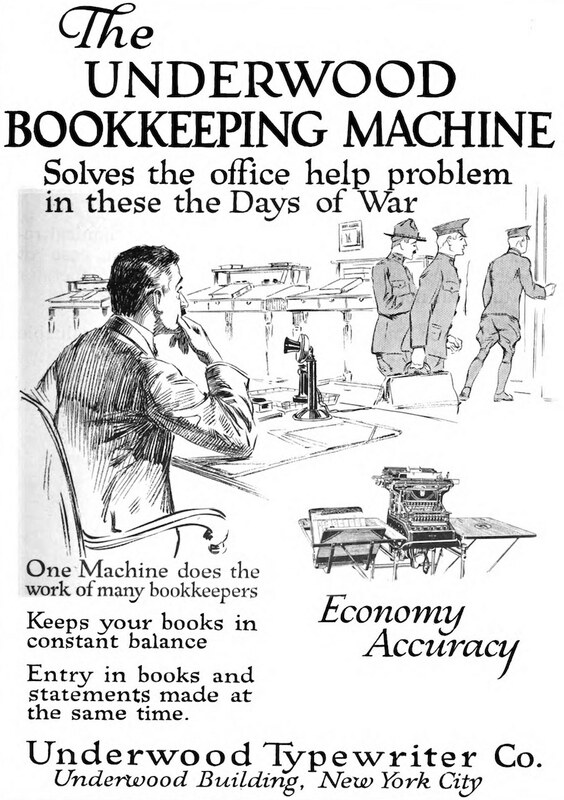 Labor efficiency was crucial during the war and typewriter manufacturers capitalized on this point. 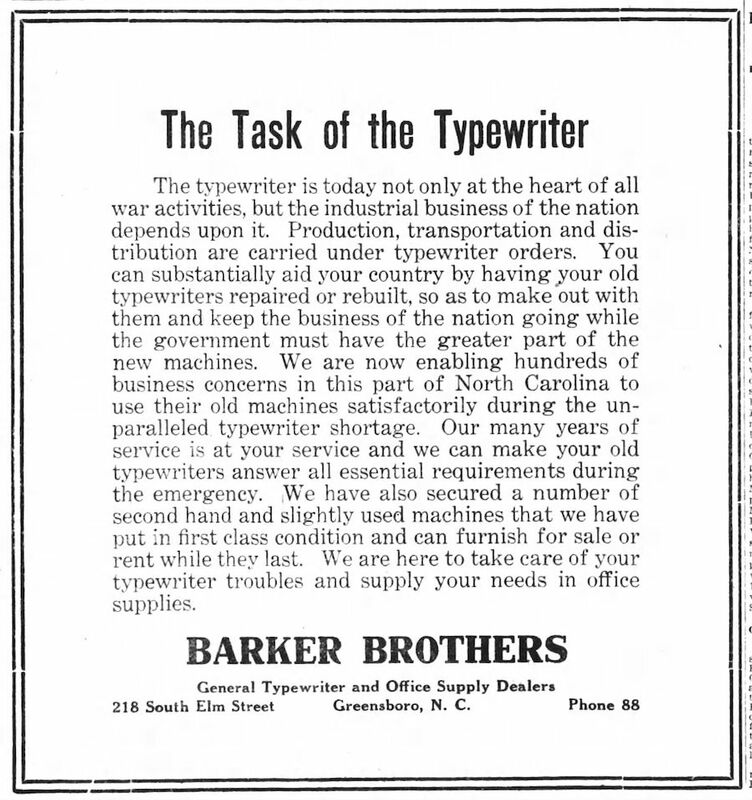 Advertisement from a 1918 Typewriter Topics issue. What, besides insufficient supplies of raw materials, could have kept these companies from meeting market demands? What I’ve presented is anecdotal, but evidence suggests that the conflict and post-war conditions significantly impacted typewriter manufacturing. It’s possible that smaller companies struggled to acquire raw materials, and this may account, in part, for failures in the 1920s. Larger companies, like Remington and Underwood, seem to have struggled too. As we continue to commemorate the 100-year anniversary of the start of the Great War, further research in this area is vital. What To Do When War Breaks Out – Pack Up The Typewriters and Skedaddle – muses Messenger, “In the past week the world has been marking the centenary of “The shot that was heard around the world”. On June 28, 1914, Archduke Franz Ferdinand of Austria and his wife Sophie, Duchess of Hohenberg, were shot dead in Sarajevo by Gavrilo Princip. The assassination led directly to World War I. During the next four years, 37 million deaths followed. Naturally, I was wondering what was happening in the typewriter world when this far-reaching event occurred.” He offers an interesting account of events in Europe. Feel free to post more links on this topic in the comments section.